Why are people hitting themselves in the face with pie? NEW YORK (KFSN) -- There's a new challenge taking shape that has people hitting themselves in the face with a pie to raise awareness about a rare condition, Gastroparesis. The Pie Face challenge was started by Andrew Belliveau from Lynn, Massachusetts a few months back. Belliveau, now 20, suffers from the condition that causes stomach muscles to work improperly. Patients are unable to digest food properly, causing severe nausea and vomiting. "Gastroparesis was the most debilitating condition I had. GP caused me to have 24/7 constant nausea and vomiting episodes up to 20 times a day for 3 straight years. It was living hell," he wrote on Facebook. So far, Belliveau has gotten many Boston Red Sox players to participate in the challenge, and now Yankees shortstop Didi Gregorious has taken the challenge. 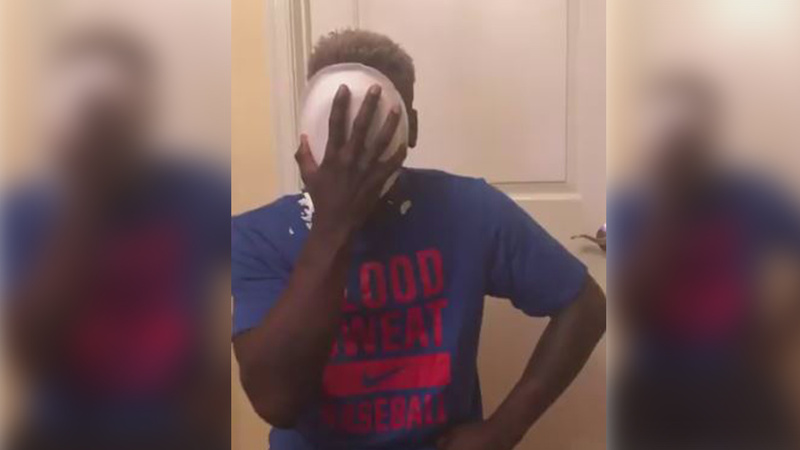 Record yourself smashing a pie tin full of whipped cream in your face, post it on social media and challenge someone else to do the #GPPieFaceChallenge. Participants are also encouraged to donate to G-PACT, a non-profit that conducts resaearch and provides resources for Gastroparesis and other digestive tract conditions. So far, more than $5,000 has been raised, Belliveau said.